Insight is a product that filters, refines, transforms, enriches and interprets raw financial data. Its ability to capture and represent such data has created a competency in data analytics, which, combined with our other legacy capabilities, enables us to give the users of Insight that extra edge. Insight is one of the most exhaustive products relating to Indian financial markets, encompassing the accurate and objective data. 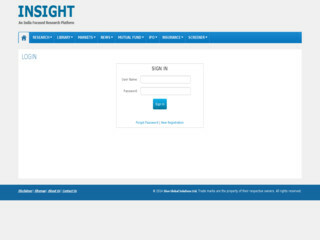 With Insight, you can conduct your research on any asset class equities, mutual funds, commodities, debts.